Falcon is happy to coordinate the delivery of your shipping container from our facility to your chosen site. 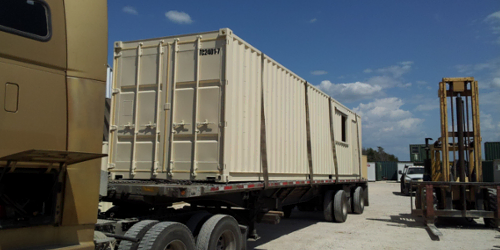 We take an active role in guiding our customers through the entire modified shipping container delivery process. 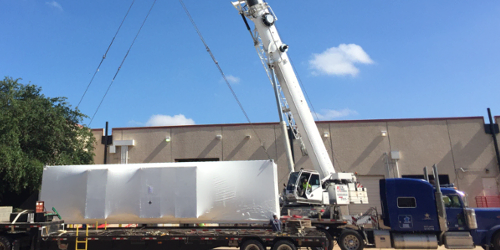 Moving thousands of pounds of steel may seem daunting at first, but we’ve successfully moved modified shipping containers for hundreds of customers. Here is what you can expect. If you need a modified shipping container delivery to a site less than 200 miles from our facility, we’ll likely use a tilt bed truck. Tilt bed trucks tip their beds up at an angle to slide the cargo off. This allows the driver to pull up to the desired site and set the container on the ground with no additional equipment. Tilt bed trucks require a significant amount of room to access the location where the container will be placed. We will consider this when deciding whether a tilt bed truck is right for your situation. The ground where your modified shipping container will sit should also be dry, firm, flat, and level. A flatbed truck has a simple flat platform with no surrounding walls. Unlike tilt bed trucks, a crane or forklift is needed to move the modified container on and off the bed. Because using a tilt bed truck costs more per mile than a flatbed, it is usually more cost-effective to choose a flatbed and then rent a crane or forklift when delivering modified shipping containers to locations further than 200 miles from our facility. Because high-cube containers are 9.5-feet tall—a foot taller than a standard shipping container—transporting them calls for a step-deck truck. Step-deck trucks are similar to flatbeds in that both have simple wall-less platforms and call for a crane or forklift to move the container off the bed. However, step-deck trucks have lower beds to keep tall loads, such as high-cube containers, within legal height limits. How a modified shipping container is removed from the truck will depend on the size of the container. If it’s 20-feet long or less, a forklift with 6-foot tines can lift the container by its built-in pockets. Larger containers require a specialty forklift with 8-foot long tines. This is because 6-foot tines may pop through the flooring of larger containers due to the additional weight. We have found that renting a crane is often more cost-effective for customers who need delivery of larger modified shipping containers. Thanks to their built-in corner castings, crane operators can easily rig shipping containers for transport. The customer is responsible for making forklift or crane arrangements. However, we are happy to provide guidance on the best solution for each situation. If you have questions about whether a modified shipping container is right for your business, contact us at 877-704-0177. A Falcon sales rep will be happy to help. Ready to purchase a modified container?